Kick off the holiday season at Cannery Row Holiday Tree Lighting ceremony for wonderful holiday spirit and family festivities. You can also attend Pacific Grove's official Christmas Tree Lighting celebration at Jewell Park. Festivities include live entertainment by school bands and choruses, holiday refreshments, dance show, and visit Santa ar the Jewell Park gazebo. Christmas at the Inns is a must attend two-days holiday event. Visit 10 bed & breakfast inns decorated for the holiday with live music at every inn and holiday treats. This is a great celebration for the entire family. Tickets are $20 per person, good for both nights. Children 12 and under are complimentary. Tickets must be picked up at the Pacific Grove Chamber of Commerce office at 584 Central Avenue. Call (831) 373-3304. Limited number of tickets. Holiday Parade of Lights on Lighthouse Avenue in downtown Pacific Grove will feature marching bands, holiday floats, dance-teams, equestrian groups, and of course, Santa Claus. After the parade, stores will remain open for holiday shopping, photos with Santa and carolers. Event begins at 6:00pm Rain or Shine! Monterey's traditional Community Christmas Tree Lighting Celebration takes place on Friday, December 1st on the lawn in front of historic Colton Hall from 5:00 – 6:00 pm, featuring carols, candles, cookies, cider, music and good cheer. FREE! Sponsored by the City of Monterey, First Night Monterey, and the Old Monterey Business Association. Christmas on the Wharf kick off today until December 17th. Weekend festivities on Old Fisherman’s Wharf feature holiday entertainment, a dazzling array of beautiful holiday lights and decorations, a 19-foot Christmas tree, free sweet treats, free Santa “meet and greet” visits, photo ops with Santa and lovely holiday princesses and much more! Celebrate the season at Monterey Bay Aquarium Holiday Dinner! Start your Member Night with a delicious dinner in Cindy's Waterfront restaurant and enjoy a fixed menu featuring seasonal selections. The dinner is limited to Aquarium members; seating is limited and reservations are required. Adult price is $55 (plus tax and gratuity); child price (under age 12) is $20 (plus tax and gratuity). Carmel-by-the-Sea will also be celebrating the Holiday Season at its annual City Holiday Tree Lighting and Carmel Plaza Holiday Party. The City Holiday Tree Lighting is held at Devendorf Park on Ocean Avenue between Junipero and Mission, where the Monterey Fire Department will deliver Santa Claus. City Tree Lighting Entertainment starts at 3:30 p.m., and Mayor Steve Dallas will light the tree at approximately 5:45 p.m. Rain or Shine! Stillwell's Fun in the Park will take place at Caledonia Park in downtown Pacific Grove behind the Post Office and will be the site of a huge holiday party. Lots of wintry fun for all! Santa will arrive at noon, joining the Snowman and Snow Queen. This event features complimentary rides, bounce houses, petting zoo, and entertainment. 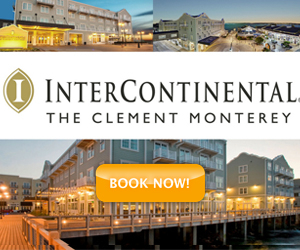 Monterey Yacht Club's lighted boat parade, "Brighten the Harbor" is not to be missed! Watch decorated boats cruise along Monterey Bay's coastline from 5:30pm-8pm. Christmas in the Adobes will make you return to the days of Alta California and see Monterey’s historic adobes splendidly decorated for the season with welcoming, candle-lit luminarias at each entrance! Enjoy festive music, living history portrayers, and the warm spirit of this year’s celebration that has become a family favorite during the holidays. Twenty-two adobes located throughout Monterey’s historic downtown open their doors for the festivities from 5 pm to 9 pm on December 8 & 9. Carmel-by-the-Glass Winter Holiday Party is a Carmel holiday tradition pairing local wines, local chefs and jazzy holiday music inside the grand ballrooms at the historic La Playa Hotel. Pèpe and Galante team up to showcase Carmel as a wine oriented destination, contribute to the economic revitalization of the village, along with raising funds and awareness for the restoration of the Carmel Mission Basilica. Pacific Grove Chamber of Commerce and the Arthritis Foundation's 5K Times Run/Fun Walk and a 1K Elf Run with kids has returned! Jingle Bell Run With Santa is a fun, festive event for the whole family! Tie jingle bells to your shoelaces, put on your reindeer antlers and your running shoes and come join us for some holiday cheer. As a community celebration of the arts on New Year's Eve, First Night is Monterey is an exciting, imaginative and uplifting cultural event. FNM is an affordable, alcohol-free family celebration from 3 pm to midnight. Performances range from Classical to Hip-Hop, Jazz to Reggae, dance ensembles and artwork created at our year-round outreach programs. Kids' Night Out features music, art & activities for the little ones, culminating with the Twilight Procession at 5:30 pm. Have a wonderful holiday! If you’re looking for non-holiday events, check out upcoming events calendar.